Visit the Idyllwild Nature Center in the mountain community of Idyllwild this Memorial Day weekend to learn about local wildflowers and native plants. This fun-filled weekend also includes guided nature walks, an art exhibition, and activities for the entire family. Weekend visitors to Idyllwild also have the opportunity to start a personalized guide to plants at ArtPlantae. Create your own personalized guide to plants! 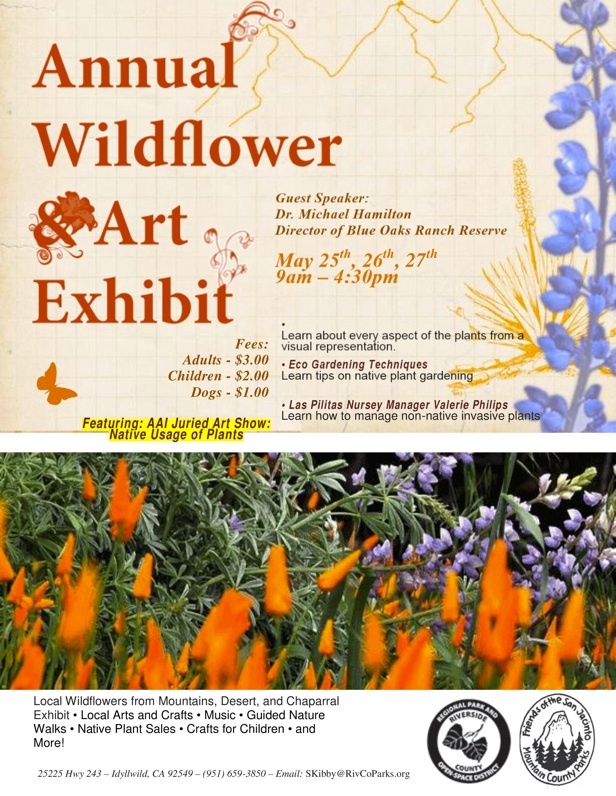 Purchase a sketchbook at ArtPlantae during the Annual Wildflower Show and Art Festival at the Idyllwild Nature Center (May 25-27, 2013) and attend any of the sessions below for free during the Memorial Day weekend. Limit 10 people per session. Participants may repeat a session if space is available. Priority goes to first-time attendees. Waiting lists will be established if necessary. Please register early. Sessions will begin promptly at their scheduled start times. 9:30 – 10:30 – What makes a stem a stem? 11:00 – 12:00 – What makes leaves, leaves? 1:00 – 2:00 – What makes flowers, flowers? 2:30 – 3:30 – What makes fruit, fruit? 9:30 – 10:30 – What makes fruit, fruit? 11:00 – 12:00 – What makes a stem a stem? 1:00 – 2:00 – What makes leaves, leaves? 2:30 – 3:30 – What makes flowers, flowers? 9:30 – 10:30 – What makes flowers, flowers? 11:00 – 12:00 – What makes fruit, fruit? 1:00 – 2:00 – What makes a stem a stem? 2:30 – 3:30 – What makes leaves, leaves?